I'm not entirely sure what showrunner Steven Moffat or returning episode writer Chris Chibnall were thinking when using the "power of three" in 'Doctor Who' - a phrase etched in recent TV history as the foundation of US supernatural drama 'Charmed'. But much like that show, this episode was very much about family - as the Doctor and the Ponds time winds down together. The opening narration of 'The Power Of Three' reflects on the duality of life for Amy (Karen Gillan) and Rory (Arthur Darvill) who have their mundane everyday lives interspersed with their adventures with the Doctor. The Doctor rarely stays still, let alone with the Ponds. This time, however, he does - as millions of mysterious small black cubes appear across the world overnight. The Doctor (Matt Smith) hangs around to observe the cubes, becoming progressively angsty as his patience wanes - this series has seen less of the endearing, charming nature of the Doctor and surprisingly highlighted many of his flaws. He disappears off on his adventures for a while as the cubes show no change before returning, somewhat conveniently as they spring to life. The plot of the 'Power Of Three' is something of a side note in this episode, a particular shame due to its promising "slow invasion" premise and the . By the end of the episode, some parts remain unexplained (aliens in the hospital - why?) while the resolution is, again, a little too convenient. The crux of this episode consequently becomes the tender relationship between the Ponds and the Doctor, a relationship that is coming to end very shortly - in a similar manner to this series, which takes a breather after next week's 'The Angels Take Manhattan'. That forthcoming episode looks set to be the most exciting of the series thus far, with a return for the iconic Weeping Angels. Hopefully rescuing a rather staid set of episodes. 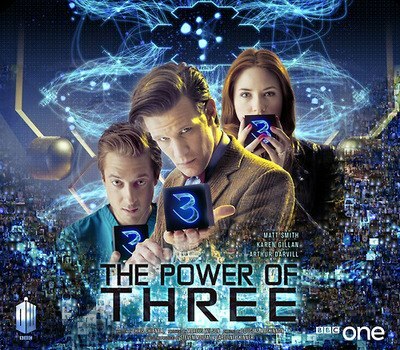 'The Power Of Three' is available to watch on BBC iPlayer until 19:14, Sat 6 Oct '12.